AP Inter District Transfers only on Mutual grounds, Spouse grounds and ex-servicemen requests Inviting proposals AP School Education Department Memo.No. 14022/70/2018 . Teachers Inter District Transfers Details: The Commissioner of School Education, A.P. decided that AP Inter District Transfers only on Mutual grounds, Spouse grounds and ex-servicemen requests , therefore, requested to furnish the inter-district transfer proposals in accordance with the 5(2)(c) of Presidential Order on spouse grounds and 5(2)(d) on Mutual grounds and Ex-servicemen requests... GOVERNMENT OF ANDHRA PRADESH SCHOOL EDUCATION (SERVICES.II) DEPARTMENT has released Memo.No. 14022/70/2018 Services. 2 SECT., Dated 11/05/2018. As per this memo 14022, Inter District Transfers Details are given below. Sub: School Education Dept. 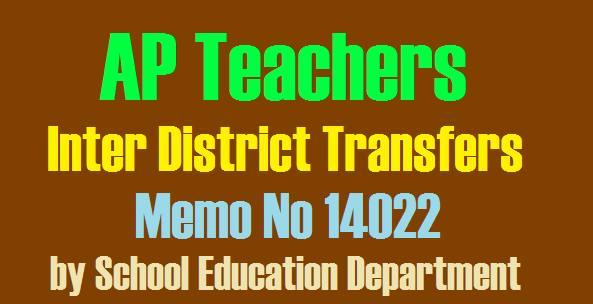 - Inter-district Transfer of teaching staff of School Education Dept. - Proposals called for - Reg. Ref:- From the C.S.E., A.P., Ibrahimpatnam Lr.Rc.No.529/Estt.III/ 2018, Dated 24/04/2018. The attention of the Commissioner of School Education, A.P., Ibrahimpatnam is invited to the reference cited. After careful examination of the matter, Government hereby decide not to take up compulsory transfers during this year and also decided to consider inter-district transfers only on Mutual grounds, Spouse grounds and ex-servicemen requests.